A second card for the B+W challenge at Double D, using a few of my Marianne Design dies for Marianne's Design Divas where the option is to use hearts. FANTASTIC Jenny! I'm so glad you've come back with yet another awesome creation to share in our challenge! Love these French cats and what a wonderful design! Well done! Thanks so much for joining in the fun at our Double D ‘BLACK & WHITE’ challenge! We hope you’ll come back often. Stunning! Wow! I love the black and white and your design and those little cats are precious. Fantastic card. Another stunning card..love the cute cats! This is great thanks for joining Cardz TV Stamps! Wonderful design! 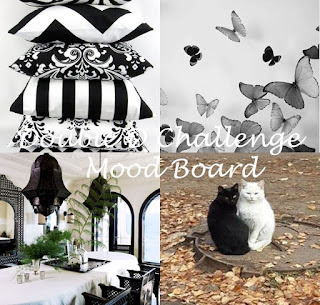 I love your cats (and the kitty in your profile picture) and the great black and white design! Super sweet. Super cute! Love the double hearts and kitties! Thanks so much for playing along with us at The Double D Challenge Blog, Donna, DT Member. I LOVE the cats! They look so pretty in silhouette against the designer paper, and so sweet with the hearts. Brilliant black and white design! Thanks again for playing along with us at Double D!